Kylie Jenner practically grew up in the limelight since her family thrust her in the middle of Hollywood fame. And, since she’s part of a family with a household name, she’s frequently spotted on the red carpet, gracing different events. 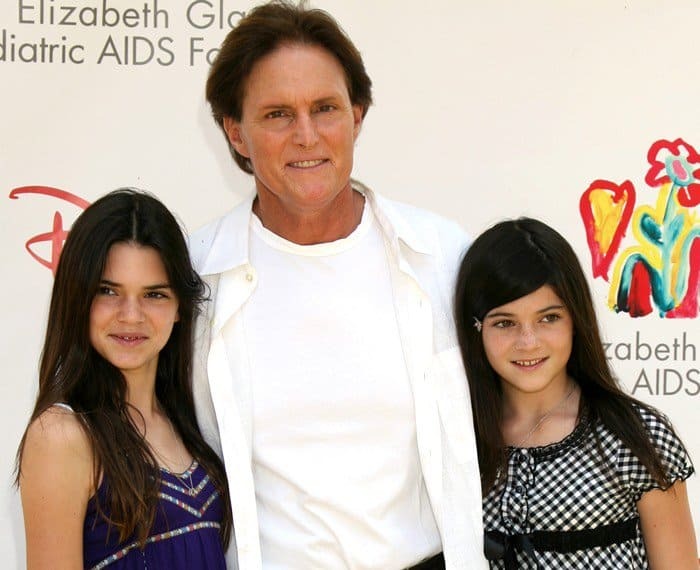 Television personalities Kendall Jenner, Bruce Jenner and Kylie Jenner at the A Time for Heroes Celebrity Carnival Sponsored by Disney benefiting the Elizabeth Glaser Pediatric AIDS Foundation at the Wadsworth Theater on June 8, 2008. The now 20-year-old reality actress has also had a very interesting style evolution. Check out how much she has changed in the past nine years. Kylie didn’t look thrilled to be wearing this white lace dress and ruffled jacket accessorized with layered necklace. It was age-appropriate, but looked totally normcore compared to her sisters. Kylie Jenner with Kendall Jenner, Kourtney Kardashian and Kim Kardashian at the Teen Choice Awards 2009 held at the Gibson Amphitheatre in Los Angeles on Aug.9, 2009. Clothes started to get tighter and hemlines got higher. This year marked the start of provocative dressing for Kylie. Kylie Jenner at the opening night of “The Taste of Beverly Hills” festival in California on Sept. 2, 2010. Kylie showing off her feet in platform sandals. Kylie Jenner at the Los Angeles premiere of “Burlesque” held at the Grauman’s Chinese Theatre in California on November 15, 2010. Kylie Jenner wearing sky-high heels by Christian Louboutin. It was the year for sky-high heels and bodycon dresses for the teenager. Kylie Jenner at The Twilight Saga: Breaking Dawn – Part 1 World premiere held at Nokia Theatre in California on Nov. 14, 2011. Kylie Jenner and Kendall Jenner at the grand opening of the Kardashian Khaos at The Mirage Hotel and Casino in Las Vegas, Nevada on Dec. 15, 2011. This seems to be the year Kylie discovered the ubiquitous cut-out dress. We can’t believe this trend has been around for so long already. Kylie Jenner at the Los Angeles Premiere of “The Vow” at Grauman’s Chinese Theatre in California on Feb. 6, 2012. Kendall and Kylie Jenner at the 2012 Teen Choice Awards held at the Gibson Ampitheatre in California on July 22, 2012. Not much changed since the previous year, but for this particular event, Kylie opted for a classy red dress. Kylie Jenner attends The Heart Truth’s Red Dress Collection during Fall 2013 Mercedes-Benz Fashion Week at Hammerstein Ballroom on February 6, 2013 in New York City. 2014 was the year of changes for Kylie. She looked startlingly different with her less prominent jaw, fuller lips, bolder make-up and shorter locks that she dyed green. Her style also started becoming more revealing, as evident in this cleavage-baring white dress that she wore with strappy heels. Kylie Jenner at the 2014 Billboard Awards Red Carpet at the MGM Grand Resort Hotel and Casino in Las Vegas on May 18, 2014. This year, she made waves online as well as on the red carpet with her bolder style. Her outfits got more couture and less RTW. Kylie also went back to her signature long hair. Kylie Jenner at the 2015 Billboard Music Awards in Las Vegas on May 17, 2015. Kylie Jenner at the 2015 NBC Universal Cable Entertainment Upfront – Red Carpet Arrivals in Manhattan on May 14, 2015. Present day Kylie still prefers her skin-baring clothes. All traces of the girl she once looked like are now gone thanks to a significantly different face. Kylie Jenner at the PrettyLittleThing Launch Party in Los Angeles on July 7, 2016. Kylie Jenner at the InStyle and Warner Bros 73rd Annual Golden Globes Post- Party at the Beverly Hilton Hotel in Los Angeles on January 10, 2016. At the launch of Sugar Factory Brasserie in Las Vegas, she showed off her figure in a Bec & Bridge dress a pair of cotton candy blue Stuart Weitzman “Nudist” sandals. The rest of the year, Kylie rarely appeared in public after becoming pregnant with her boyfriend Travis Scott. Kylie Jenner continues the grand opening celebration of Sugar Factory American Brasserie in Las Vegas at Fashion Show Mall on April 23, 2017. What do you think of Kylie’s style evolution? Which year was your favorite?